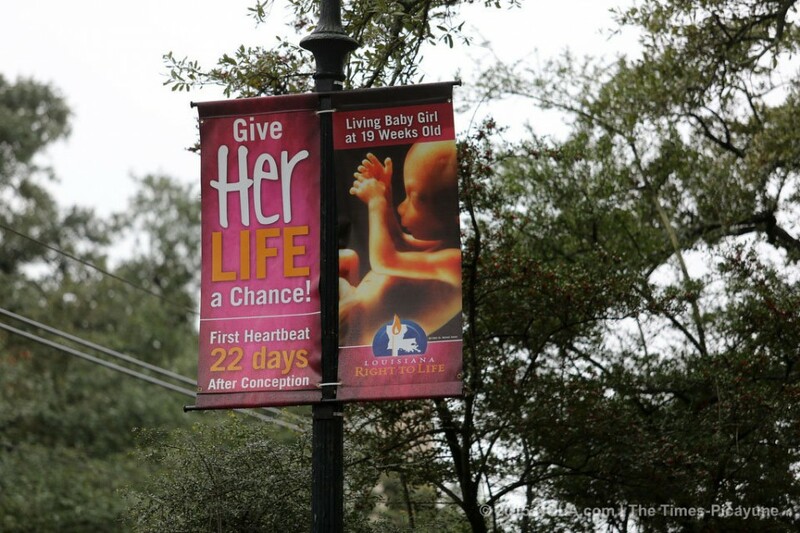 Today’s battle in pro-aborts’ never-ending struggle against free speech comes from New Orleans, where City Councilwoman Stacy Head is calling for removal of pro-life banners (pictured above) from city streetlights. I’d like to see in writing for every council member the price and the process for putting signage along St. Charles Avenue and specifically I’m talking about the political, what I’d consider to be political signage that is put on for particular political position that I perceive as a nuisance, I perceive it as offensive, I do not see it as community awareness, and I do believe it is negatively impacted my belief about my civil liberties as a woman, and I believe that I am being discriminated against. I understand that the administration has very strong feelings about, they get to decide what is allowed and what is not allowed on our public spaces with regard to visions, with regard to images, with regard to symbols, who we are gonna be in 2018, so since they are the arbiters of those items, I think it is very important that we understand what the methodology is for placing those signs, the cost of placing those signs, the process for placing those signs, and what the decision-making process is, and who gets to decide that for us, since we are looking to the administration to decide what objects and symbols are appropriate for the city, on city property, which ones offend us, which ones are negative, which ones are, and whether or not maybe I as a woman would have standing if I believe and feel that the nuisance that I have to see impacts negatively my civil liberties. But Head’s lack of preparedness is nothing compared to the sense of entitlement on display here. To say that the mere sight of a differing point of view—and in this case, an expression of that view comprised solely of an inoffensive picture, a true fact, and a respectfully-phrased plea—constitutes “discrimination” and a “civil liberties” infringement is so preposterous that the only appropriate reaction from her colleagues would have been to burst into laughter. From buffer zones to lawsuits over billboards to this, pro-aborts have never respected the right to free speech any more than they respect the right to life. Part of that is simple greed and arrogance, but in this case it’s also fair to say that fear of the truth is also a powerful motivator. If your reaction to the sight of a baby and a plea to show her a little compassion is to lash out so viscerally and disproportionately, that’s probably a sign the message got to you more than you’re willing to admit. Some part of Stacy Head knows what the banner means for her support of abortion, so she hopes that getting it out of her sight can help make her willful denial a little less uncomfortable.